We began putting the set into the theater on Friday the 17th. I packed the Hyundai Tucson with everything that needed to be assembled and as much else as possible (props, tools, the conductor's stand that I had made years ago for the company, extension cords for the music stand lights, touch-up paint and sundries (I've learned to bring too much in terms of tools and supplies to the put-in as other departments (lighting, costume) often find themselves needing things they didn't bring). We're a small company and the emphasis is on the work (in this instance the company's tenth newly commissioned opera) rather than on lots of scenic spectacle, although we've put on some impressive sets when necessary. I'm a "triple dip" member of Intermezzo -- Board member, scenic designer, and co-librettist for two of those commissions. The work was completed by mid-afternoon and I returned home for three days, since it was the M.L. King Holiday weekend and Suffolk University, which owns and operates the Modern Theater, was closed for the duration. On Tuesday I drove down with all the furniture items that would fit in the car and did a lot of finishing details. I wasn't needed in the evening as it was a strictly musical rehearsal. On Wednesday I arrived with the last of the furniture and stayed through the evening technical rehearsal with singers in costume. There were very few stops to correct things or to re-run lighting cues and it became obvious that the cast was deeply into their roles and that the score was going to sound great in the Modern's slightly dry, but gorgeous acoustics. Thursday and Friday were dress rehearsals. Fritz came down with me on Friday night and we sat there for this, the second opera for which we'd written the text, again with a bit of an "OMG, they're singing our words!" feeling. And they most certainly were singing our words fantastically well, with virtually perfect enunciation -- clear as a bell -- and some of the finest voices from the very rich Boston music scene. There was a small audience on Friday, the final dress rehearsal, of friends and relatives of the cast and the eight super musicians (2 violins, viola, cello, bass, clarinet, bassoon and horn) in the pit. Reaction was very good. The Saturday night opening was already sold out with a waiting list and Sunday had a bare handful of tickets remaining; we drove home very happy. The opening night went perfectly. 45 minutes before curtain we did a half hour talk with the audience about the origins of the opera (Fritz's idea that Anne Hutchinson would make a great operatic character and that the noted contralto Marion Dry would be the ideal Anne, as she proved to be). I talked about the construction of the libretto, director Kirsten Cairns about her conception of the chorus as interlocutor with the audience, and composer Dan Shore spoke about the unique challenges of writing for the contralto voice versus the standard soprano in an opera's leading role. The premiere was very well received with big applause throughout the calls, but especially for David Kravitz's powerful Governor Winthrop and Marion Dry's magisterial, multi-faceted Anne. The performance was recorded on Saturday night and a DVD will be ready in about 2 weeks. There's a scene we invented to end the opera when Anne, after receiving her guilty verdict for heresy and being banished from Boston -- essentially, for being an uppity, activist woman in a society that wanted docile, submissive ones -- fears that what she stood for, that what she preached, might not survive. Gradually, figures from equality, civil rights and religious freedom struggles from the 17th century into the modern age come to her to say what an inspiration she was to them, how her struggle for equality gave them the courage to endure their own persecutions and force social change. The great final ensemble then turns to the audience and and bids them keep Anne's message alive in today's world. When the curtain fell on the Sunday matinee, the audience stood and roared. It was a real thrill. And then, in the great theatrical tradition, the designers and stage crew struck the sets, lights and costumes, packed everything up and cleared the theater for the next group who will be using the stage. The setting of the opera is Anne’s trial in Newtowne (now Cambridge, MA) for heresy and for teaching religion in 1637. 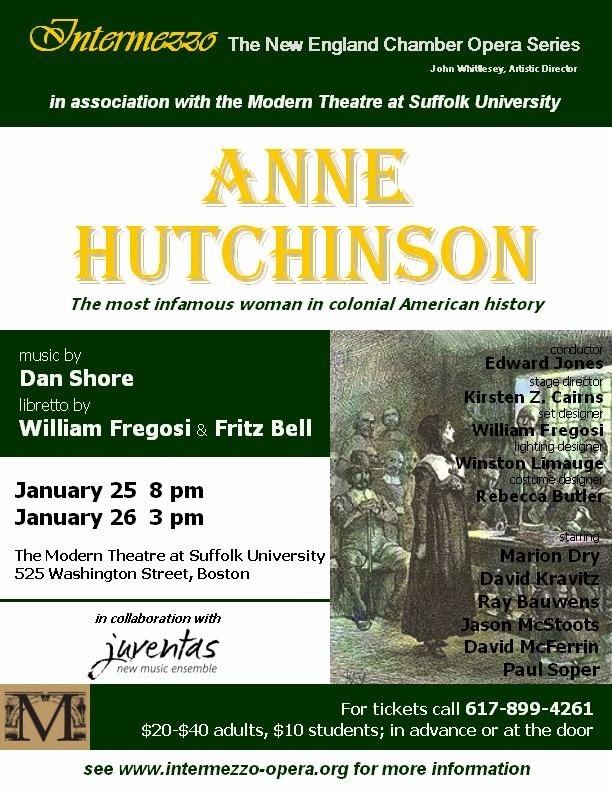 Flashbacks occur throughout the opera, providing insight into Anne's path from England to the Massachusetts Bay Colony. 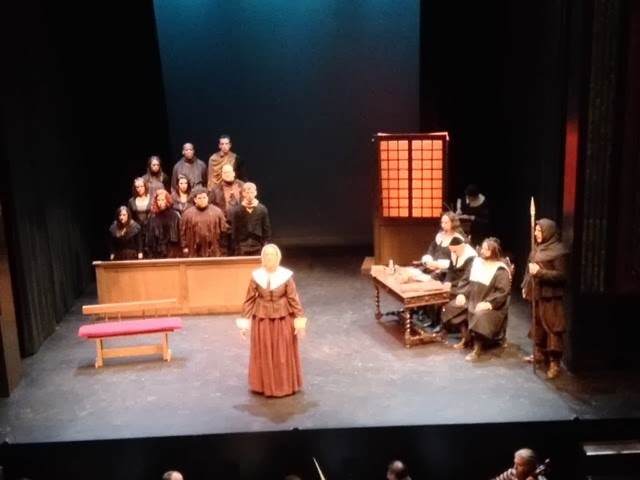 The opera opens as Anne stands before Governor John Winthrop and the Ministers, demanding to know why she is summoned to court. She is given vague generalities and refutes every one. She is not above the use of sarcasm to score her points, to the delight of her supporters in the room. The first flashback takes place in London, 1610, between Anne and her father, Francis Marbury., who is deeply devoted to Anne and her education. Marbury is wary of Anne’s interest in teaching others, given the persecution he has endured, but Anne is resolved. Returning to the court room, Anne points to Scripture supporting an older woman's right to teach younger women, again challenging the Ministers to explain why she has been called to court. Winthrop condemns her teaching and her refusal to comply with a desist order. He further criticizes her for usurping the male role of superiority and control. Rev. John Cotton calls for calm, defending Anne's teaching and the loving relationship between Anne and her husband. The second flashback shows Anne and Will in Alford, England in 1613. They playfully discuss their pending marriage as a true partnership. Anne embraces the work of women, but also establishes her need to have her books, pen, and use of the house to teach others, led by her mentor, Rev. Cotton. Will promises love and support. The assault on Anne continues back in the courtroom. Rev. Cotton continues to defend Anne but Winthrop threatens him with the loss of his church and banishment if he will not stand with the prosecution. As the court adjourns, Rev. Hugh Peter hands Anne a transcript of the proceedings for her to review and correct if she so desires (something unheard of for the time, as women's words were not considered worthy of transcription). She is stunned that her words will survive in the public record. Act 2. The next morning, Rev. Cotton agonizes as to which position he will take -- to defend Anne and sacrifice his ministry, forcing his family into exile in the wilderness, or to violate his principles and allow the Ministers to convict her. Flashback to 1633 in England, where Cotton tells Anne that his safety is in jeopardy for his teachings and that he is leaving the next morning for a new colony that has been founded by John Winthrop, the "city on the hill.” He cautions that it will soon be unsafe for her as well and urges her to join him as soon as possible. Back in the courtroom, Anne states that she has answered all their questions, challenging them to show her a law that she has transgressed. Winthrop, seeing Anne as a direct challenge to his vision of the new colony and his power, brandishes the Bible as the only law needed to convict her. When Anne states that God speaks directly to her (which is only supposed to happen to Ministers), Winthrop sees his opportunity. He corners Cotton and forces him to betray her. Anne forgives him, while Cotton retreats in his personal shame. But Anne refuses to back down, and thus seals her fate. She instructs the Scribe to write down her words for future generations to understand; she recounts her vision of being persecuted in a distant land, and hearing the voice of God say he will deliver her. She no longer needs the help of the Ministers to teach the word of God, which she says comes directly to all, women as well as men, a gross heresy. Elated, Winthrop pronounces her sentence -- banishment from the colony. As the courtroom fades away, Anne wonders if her words will live on. One by one, future advocates of civil rights--Mary Dyer, Abigail Adams, Frederick Douglas, Rosa Parks, and Harvey Milk--step forward to assure Anne that she will be remembered, and that her struggle served as a beacon to those who came after her; that her words became their words: to speak courageously what they knew to be true, no matter the consequences. They then bid the audience do the same.